Upcoming elections for the presidency of South Ossetia have been thrown into turmoil after the de facto authorities refused to register former president Eduard Kokoity and his supporters took to the streets to protest. South Ossetia's Central Election Commission on March 4 said that they would not allow Kokoity to run in the April 9 elections, on the grounds that he fails to satisfy the ten-year residency requirement. He has been living in Russia since leaving office in 2011. The vote will pick a new leader of South Ossetia, which considers itself an independent country, but is recognized as part of Georgia by Tbilisi and most of the rest of the world (with the conspicuous exception of Moscow). Following the decision, Kokoity rallied his supporters in South Ossetia's capital, Tskhinval (which Georgians call Tskhinvali), to protest. In response, the authorities temporarily closed the center of Tskhinval to motorized traffic and deployed security forces. Not everyone has fond memories of Kokoity's time in power, though, and on March 21, around two thousand people attended a counter demonstration against Kokoity. But the issue appears to have been decided: On 14 March, South Ossetia's Supreme Court ruled that Kokoity may not participate in the election. That leaves just three candidates: incumbent President Leonid Tibilov, opposition leader and parliament speaker Anatoli Bibilov, as well as Alan Gagloev, an officer in the State Security Service. At the same time as the election for president, voters will take part in a referendum on whether to rename South Ossetia to South Ossetia – Alania. That vote has been seen as a possible prelude to merging with the comparably named North Ossetia – Alania, which is part of Russia, and also has vexed other North Caucasian republics who claim the legacy of the medieval kingdom of Alania. In a rare display of criticism of Russia by a South Ossetian politician, albeit couched in a profession of loyalty to Putin, Kokoity has blamed his rejection on Russian officials Vladislav Surkov, Aleksei Filatov and Oleg Govorun, whom he accused of dictating who should be allowed to run for office, who should not, and who should be fired. Kokoity's claim that he is being excluded from the election for political reasons betrays considerable chutzpah. To be sure, the residency requirement has always been directed against opposition politicians who bided their time out of office in Russia. It was originally introduced in 2001 by South Ossetia's first President Ludvig Chibirov, to block his rival Gerasim Khugaev. But it was Kokoity who then profited, defeating Chibirov in the first round. Kokoity had been allowed to participate due to an extremely flexible interpretation of the rule. Like Khugaev, he had been living in Russia, but his post as trade representative to Moscow was deemed to qualify him as a resident. Kokoity had held the post for only four years, but the ten year duration was interpreted as not necessarily continuous. This loophole was closed in 2011, towards the end of Kokoity's second term, to block the participation of opposition leader Jambolat Tedeev, head of Russia's freestyle wrestling team. Kokoity's exclusion means that the election will be a direct showdown between rivals Tibilov and Bibilov. In the 2011 election, Bibilov was Kokoity's anointed successor, but he lost to former education minister Alla Dzhioeva, around whom the opposition had rallied after its leaders had been blocked from participating. Bibilov refused to acknowledge his defeat, leading to protests and a tense stand-off throughout the winter. In the end, a new election was held in which neither candidate was allowed to participate and from which former Security Service head Tibilov emerged victorious. 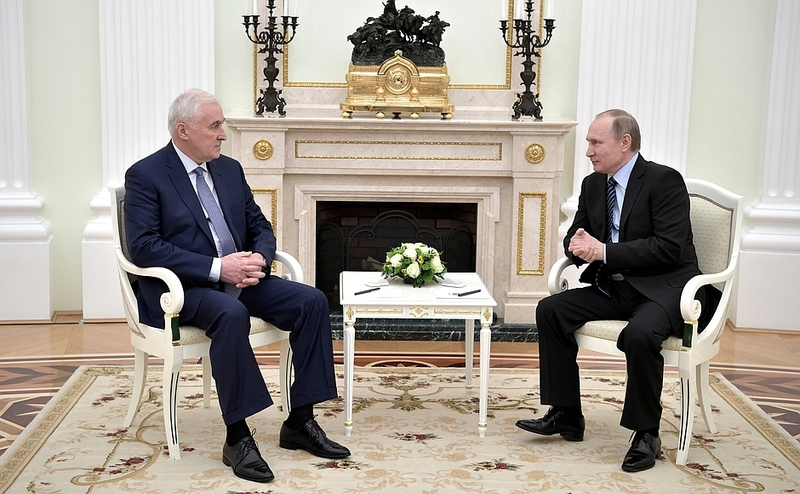 Bibilov has since pressed on with his attempts to gain power, leading the United Ossetia party to election victory, becoming parliament speaker and challenging Tibilov to seek even closer integration with Russia. Bibilov's parliamentary election victory in 2014 suggests that, despite rejecting him in 2011, voters may be more amenable this time around, driven by frustration with the government's failures and in the hope that he is the quickest ticket to unification with North Ossetia within Russia. It is however doubtful whether Bibilov would be able to bring that goal any closer. South Ossetia first held a referendum on joining Russia in January 1992, but Russia has consistently held off South Ossetian overtures, and it is easy to see why --- like Crimea, annexation of South Ossetia would come at considerable geopolitical cost, but unlike Crimea, it would be neither symbolically nor strategically useful for Russia. Nonetheless, Tibilov and Bibilov agreed in May 2016 that a new referendum on joining Russia will be held after the election.